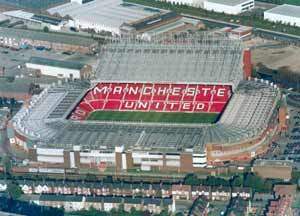 Old Trafford is arguably the most famous, and elegant ground within British sport, and despite your allegiances to your club, you have to be in awe of Old Trafford. From getting your first glimpse of Old Trafford, to when you get up quite close, the home of the Red Devils is a huge impressive complex, and holds a massive 76,212 fans. There are some drawbacks at Old Trafford though. Away fans are seated in the East Stand Lower Tier, and the first thing that you notice when you take your seat is that the ground/pitch looks a lot smaller than it does on the telly! It does come as a bit of shock and God knows what the poor sod's right at the back of the North and West stands must see. Getting away from the ground is a complete nightmare. Despite saying that Old Trafford Tram stop is near the ground, it is a good 10 minute walk from Old Trafford. The police and officials keep you back, as I witnessed for myself for 15-20 minutes after the match until the entire home supporters have dispersed. Couple this with the agonising wait for the Tram, I missed my train going back home! It took me an hour and a half to get back to Manchester Piccadilly Station, and probably has been one of the most frustrating journey's back I have experienced. If you are traveling from far a field by train, then to leave at least 2 hours to make sure that you can get back on time to the station, rather than clock watch. The match day programme is one of the plushest match day publications I have come across, and is very well put together. The new East Stand Megastore is open between 9.30am to 6.00pm Mon-Sat and 10.30am to 4.30pm on a Sunday, and is the largest in the country with a floor area of 17,000 square feet! Call the megastore on 0870-111-8107 for more information. Located within the North stand is the 'Red Cafe' (0161-868-8303). This is a Manchester United theme restaurant, but this is obviously very busy on match days. Like other large premiership clubs there is also a club museum and guided tours of the ground (...both at a cost). Exit the M60 at junction 12 for M602. At the end of the M602 follow signs for Salford Quays and Trafford Park. At roundabout turn right into Trafford Road (A5063). At the bridge over Manchester Ship canal turn right. Follow the road round to Trafford Wharf Road, and then left onto Watersreach. Continue through traffic lights onto Sir Matt Busby Way. Exit the M6 at junction 19, and take the A56 in the direction of Manchester Airport. Follow the M56 to Manchester, past the Airport and follow signs to M60 Leeds and Liverpool. Exit M60 at junction 7 (A56 Chester Road) following signs for Manchester United Football Club. Turn left into Sir Matt Busby Way. Take the M62 then M63 until junction 4. Leave motorway and follow signs for Manchester A5081. In one and a half miles turn right into Sir Matt Busby Way and United is on the left. Exit M62 at Junction 17, then take the A56 into Manchester. Follow signs south, then for Chester into Chester Road. In two miles turn right into Sir Matt Busby Way and United is on the left. The Overland train from Piccadilly and Manchester Oxford Road stop at the ground itself, though large groups of fans may not be allowed on. The Old Trafford Metrolink Station is half a mile away from the ground. To walk it, come out of station into Warwick Road. Go straight over the lights and straight over the crossroads by Old Trafford pub into Sir Matt Busby Way. Bus numbers 252, 253, 254, 525, 256, 257, 17, 114 and 236 run from Manchester Piccadilly to Old Trafford. Try the roads off Trafford Park road for street parking. There is an official car and coach park on Elevator Road, car parks on John Gilbert Way and on Talbot Road. There is also parking space available in schools on the Great Stone Road and on Talbot Road. This pub is located next to The BBC, just off Oxford Road, and has a microbrewery on the premises where they brew their own Real Ale!!! They always have several Real Ales and the atmosphere is one of the best in Manchester, leaving you up for the game at Old Trafford, which you can get to by staggering two minutes up the road in St Peters square, and jump on the Tram to the stadium. This pub is located on Salford Quays, which is just 500 yards from the ground. There are tables available outside on the banks of the Manchester ship canal. A real must on a fine summers days! This pub is located opposite platform 14 of the station. Located opposite the Trafford Bar tram station. The closest McDonalds restaurant to Old Trafford is located in the Riverside Retail Park. This is located at the ground, and is basically a glorified burger bar. there is seating, but as you can imagine, this is rather busy on match days, and getting a seat is like finding a needle in a hay stack. If you are a registered user then you can login, and create your own personal review of Manchester United Football Club - Old Trafford. These reviews can be private or public.